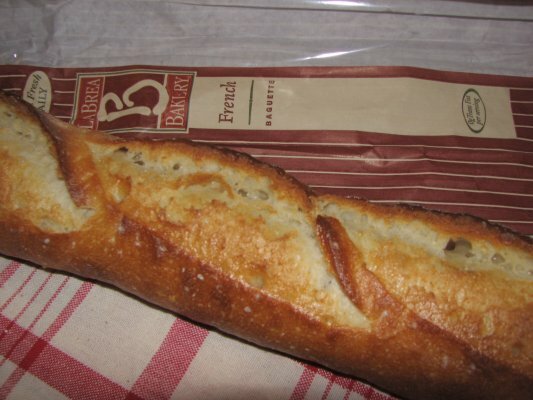 I couln’t believe it but I found some La Brea Bakery bread in a Hilo store! Not only that , but I found some San Francisco Sourdough bread as well from Raymond’s Bakery. So I bought them and brought them home to see how they compared ( In the last post there was a a contest for a free sourdough. 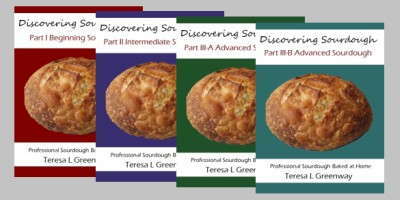 The fourth responder, Patty, is the winner of the Hawaiian Sourdough Starter, please email me with your contact info Patty). 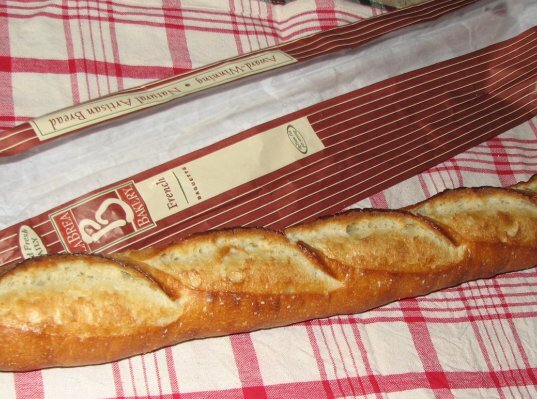 When I got home, I popped the La Brea French Baguette into the oven to crisp. I served it with a salad and pasta dish. 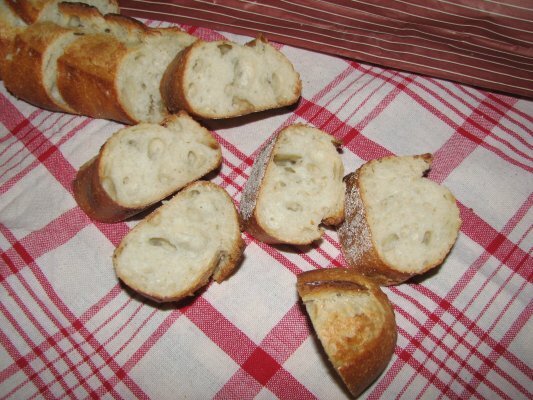 The baguette was beautiful, it had a terrific crust and very pretty slashes all down the crust. It weighed 10.5 ounces. I cut the loaf into several chunks and we had them with lots of butter. The interior was holey and light, a very nice crumb. 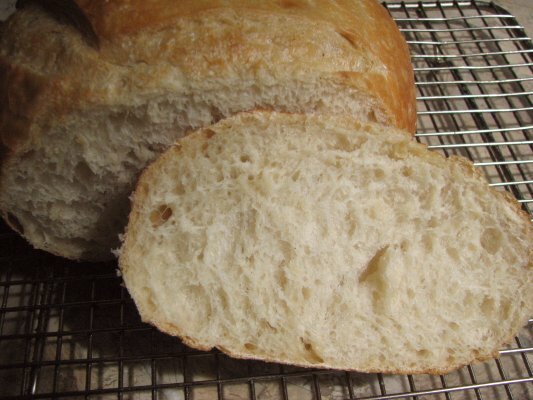 Unbleached Flour, water, sour culture, salt, yeast, semolina and some vitamins. All around the baguette was a pretty good loaf, I especially liked the crust. 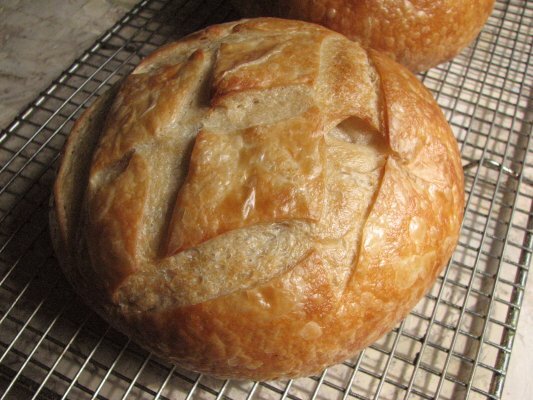 For the Raymond’s Sourdough bread, I popped it into the oven for ten minutes and served it for lunch the next day. 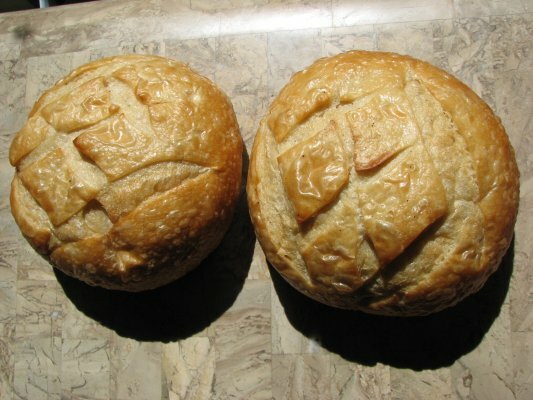 The two loaves together weighed one pound, but they were surprising large for only being one half pound each. They were almost ten inches in diameter and had great oven spring. This bread was surprisingly good. The crust was crunchy crispy, with lovely blisters. The interior didn’t have large holes, but was very fluffy and feather light. What surprised me most was how tangy this bread was. The flavor wasn’t the deep rich complex flavor you get when you bake with sourdough/motherdough at home, but it was very good and satisfying. I also could taste a very small trace of commercial yeast, but the flavor wasn’t ruined by too much commercial yeast. I am guessing they use a very small amount in the breads they bake, not enough to overwhelm the sour flavors. Enriched Flour, Doh Tone, water, salt and yeast. The Doh Tone may be the source of the sour flavor as a-amylase helps contribute to the sour flavor. 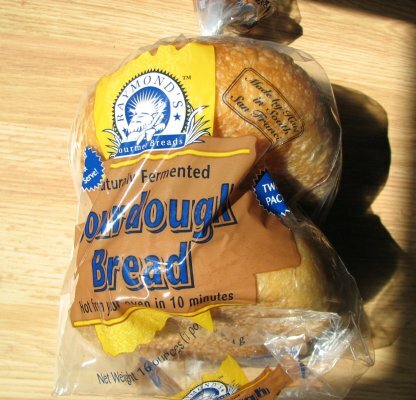 I feel this bread was a great treat, but I still prefer the chewy holey crumb and crisp crunch of homemade sourdogh with it’s subtle complet flavors. 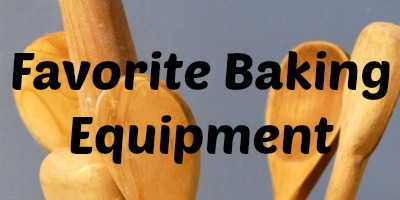 I don’t understand how high yield commercial bakeries lose this flavor, but they sure do. 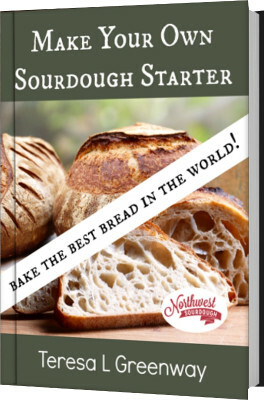 Bottom line, if you don’t have time to bake sourdough this week and you want to get some at the local store, go for it, there are some pretty good sourdough’s out there when you need a break from baking.